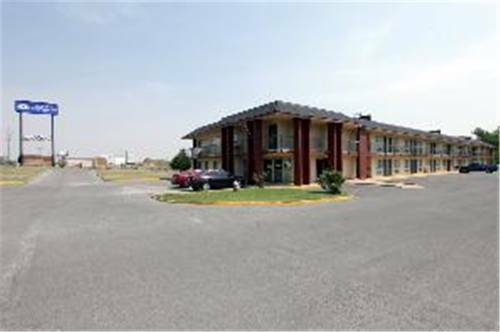 Welcome to Americas Best Value Inn/ Chickasha/ OK. Americas Best Value Inn has over 800 hotels/ the fastest growing chain of hotels of America in the last 10 years. We have 50 fully beautifully renovated rooms and they are all feature free high speed wireless Internet access/ microwave/ mini-fridge/ hairdryer/ iron/ ironing boards coffeemakers/ alarm clocks/ new carpets/ new furniture/ cable TV with HBO/ and new electronic door locks. Our guests are welcomed to join us for a complimentary continental breakfast each day. We have in-house washer/dryers and several vending machines for your convenience. We are 40 miles south of Oklahoma City Airport on Interstate 44W towards Lawton. Our inn is just minutes away from the fairgrounds which hosts several antique swap meets/ horse shows/ car shows/ and trade fairs. Minutes away from the New Chickasha Sports Complex/ which is one of the best Sports Complex of Oklahoma hosting games throughout the year. Few Blocks away from USAO -University of Science and Arts of Oklahoma. Also we are 20 miles away from Gold River Casino and Silver Buffalo Casino and famous Indian City USA/ Southern Plains Indian Museum/ American Indian Hall of Fame etc. We are conveniently located within a mile from Wal-Mart/ McDonalds/ Braums/ Taco Bell/ KFC/ banks/ ATM/ theaters/ restaurants/ and a shopping center. Our very warm and friendly staff is available round the clock to make your stay a convenient and most memorable one. The Americas Best Value Inn is located off I-44 exit 80. Make a left/ we are a few blocks away/ and we are 40 miles away from the Oklahoma City Airport..
Christian cross conveniently located next to the interstate. Perhaps an inspired disguise for the ministry's broadcast tower?